Blockchain: another buzzword everyone in the tech field is talking about. (Sound familiar? Peep our AI blog.) But does anyone outside of the tech industry actually know what it means? Well we do, and we’re here to fill you in. Blockchain is a technology allowing the transfer of digital data through a very sophisticated and secure encrypted structure. Using an analogy, a blockchain is like a company’s book of entries or ledger, where all money debits and credits are registered. However, instead of currency, this “book” registers digital events. Although blockchain has become a hot topic in the past couple of years, its popularity didn’t happen overnight. The blockchain system was created in 1991 but wasn’t used until 2009 when it became the platform behind Bitcoin. Nowadays, blockchains can be used for much more than cryptocurrencies, such as signing contracts, voting in elections, keeping medical and banking records, and many more applications yet to be discovered. First of all, the word “blockchain” itself gives a pretty good hint: a chain of blocks. Mind-blowing, I know. But what is a block? What does each block contain? 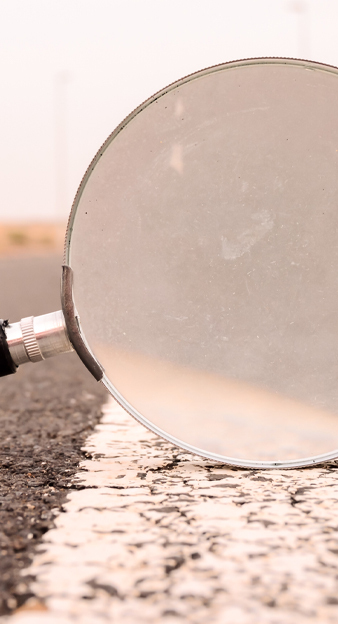 It can get a little tricky to understand since a blockchain is not something you can physically see like other technologies such as Augmented Reality (AR) . Blockchain is much more intangible. Though a bit confusing, blockchain can be broken down. 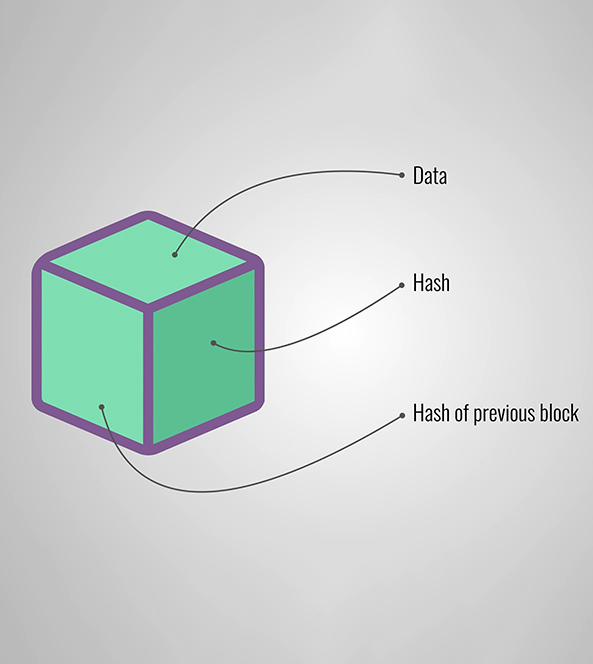 The three components of a single block in a blockchain are data, hash and the hash of previous block. The data is the information about the transactions. In the case of a bitcoin transaction, for example, such information can be the sender and receiver, the date, the amount, etc. This is the identification number of a block, sort of like a fingerprint. It is a unique and unrepeatable number, and every block has its own. The hash is the piece of a block that makes the whole chain work. It’s generated based on the content of the block, which means if the content of the block changes, the hash also changes. 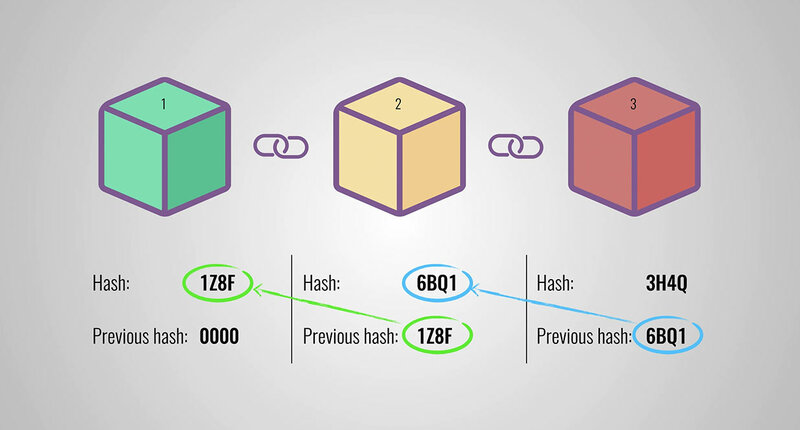 Each block is connected to its predecessor and successor based on their hashes, creating a chain structure. That way, a block cannot be removed or modified without being detected by the network. With every block maintaining this structure, they successfully create a secure chain, hence the name blockchain. A block will have a specific form based on the data it holds, but if someone changes that data, the form of the block will also change. If this happens, the block will stop fitting with the other blocks and the chain will be invalid. For this reason, this structure is especially suitable for storing data without the possibility of modification. WHY IS A BLOCKCHAIN BENEFICIAL? A blockchain is extremely secure. It protects itself thanks to its own structure and architecture. Also, the fact that there are thousands of users in a blockchain watching every transaction makes it almost impossible to modify data and get away with it. A blockchain doesn’t use a single, centralized database to store all the information about the chain. Instead, it uses a distributed ledger technology. That is, each user in a blockchain has a copy of the database, or a ledger, containing the same information with records about every transaction ever made in that particular blockchain. So, if a user changes the data on his ledger, then the rest of the users will know, making that user’s version of the blockchain invalid. This is what makes blockchains very powerful – many users providing security and certification of the data. 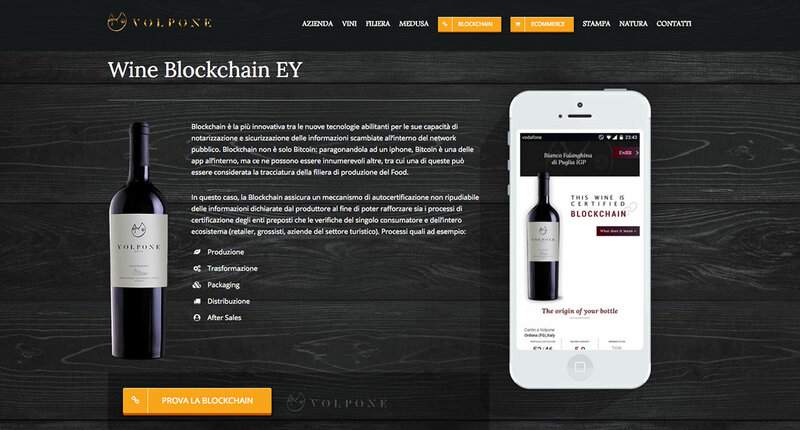 WHAT DOES A BLOCKCHAIN HAVE TO DO WITH MARKETING? Blockchains provide more security when making transactions online. Every transaction within a blockchain can be tracked from its origin to its recipient, allowing the final recipient to know the entire production process of the product or service. It would make economic transactions more secure and would end the possible fear of scams. Companies around the world are already implementing blockchain into their businesses. Also, blockchain could significantly affect the way affiliate marketing behaves. Currently, companies such as Google, Facebook or Twitter act as an intermediary; they are the connection between advertisers and digital media. This centralized affiliate network makes it difficult to track and attribute ads and clicks in relation to sales. With blockchain, this dependency and intermediation would disappear since business transactions would be carried out without the need of third parties, and it can provide a decentralized platform that can make it easier to trace and attribute individual clicks. This could imply that the way of performing SEO positioning could change as well, since websites would also have to incorporate blockchain. Eventually, blockchain can change the way we do most things in life. As a society, we produce, manage, exchange and store huge amounts of data at all times – every day, every hour, every second. So far, this data management has been done by humans. However, blockchain proposes that this type of work should be done by other types of beings – a kind that is incorruptible, efficient and fast: computers. If you’d like to learn more about blockchain technology and its relationship to marketing, our digital team would love to chat.